Being quite a maneuverable steam mop, this model can turn into a handheld device in just 2 seconds so that you could tidy your clothes, curtains, etc. It might seem rather heavy. The S3973D Shark steam mop comes with quite a wide range of accessories that are handy for mopping and sanitizing the entire house without using chemicals. 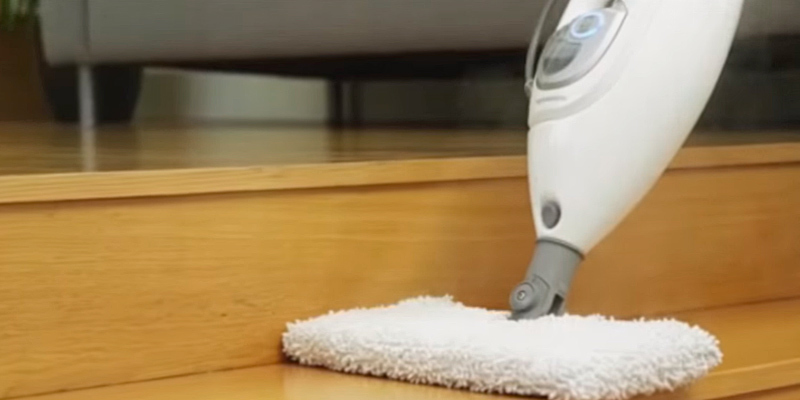 And thanks to the 3-level steam adjustment, you can tidy any surface without damaging it. 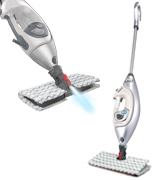 With the steam blaster function, this Shark steam cleaner can remove even the toughest dirt within seconds, reducing the mopping time to the minimum. The power cord could be more flexible. Due to the highly powerful and maneuverable construction, the Shark S5003D is a great tool for cleaning and sanitizing floor and other surfaces effortlessly. Plus, it comes with two reusable Dual-sided pads that you can attach and detach with a press of a single button. 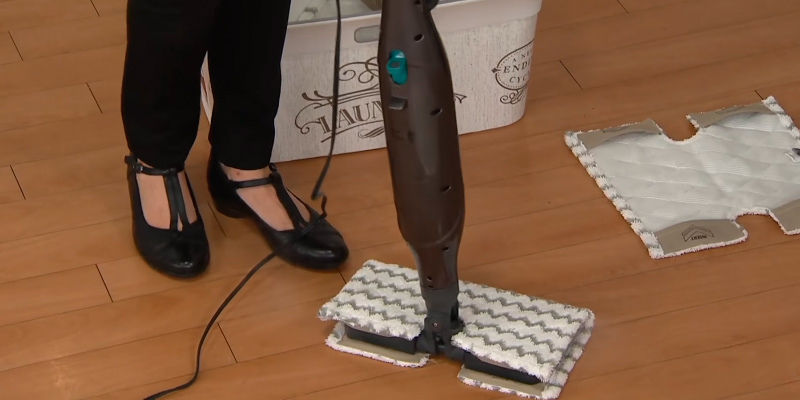 Owing to the double-sided microfiber pads that come in the box, mopping with this steam cleaner adds more convenience to the process allowing you to tidy larger areas faster. Filling the water tank might seem inconvenient. High power, capacious water container, and affordable price are only a few pros of this portable floor steamer. Another advantage of this model is that it has a telescopic tube which you can adjust in length to fit different cleaning tasks. 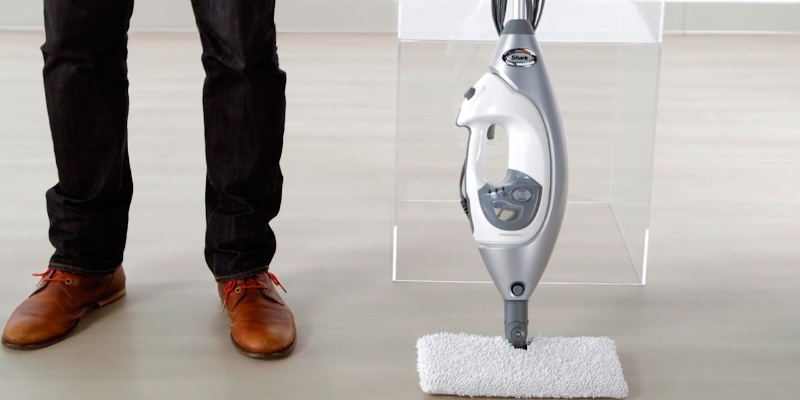 Thanks to a simple ergonomic design, this mop is ready to go almost right out-of-the-box. Just attach the handle to the main unit, fill the water tank, and in 30 seconds the mop is ready to steam. The housing of the mop is white, thus, it can be easily soiled. With users' convenience in mind, the manufacturer has made this model extremely simple in use. 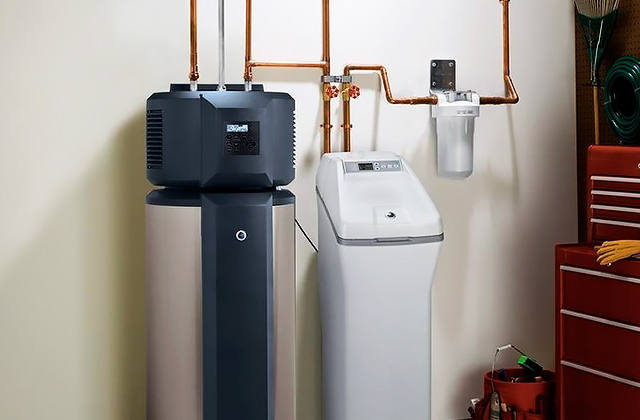 You can even refill the water tank without waiting until it cools down. The removable and pretty capacious water tank can be refilled right from the faucet. This cleaner is compact, lightweight, and equipped with an extension tube for more convenient storage of the mop. The water tank could be more capacious. 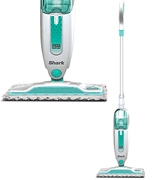 The Shark S3101 Steam Mop is a basic model that sanitizes wood and laminate floors as well as tiles. It removes small messes and sticky dirt after several passes. User-friendly and fairly priced, this tool is great for everyday clean-ups throughout a house. Would you like to clean your entire house twice as fast and twice as effectively as you do it with different cleaning appliances and solutions? 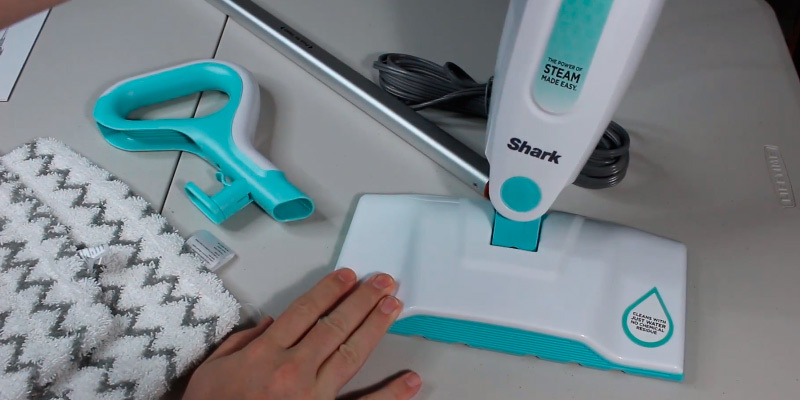 Well, with this Shark steam mop you’ll forget that cleaning has ever been frustrating. 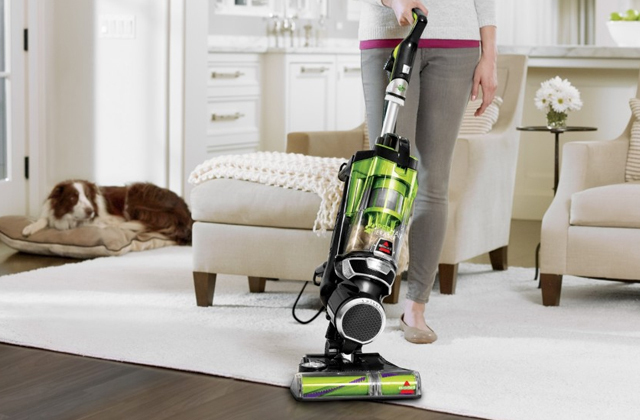 The S3973D gives you the opportunity to clean your house far and wide. It removes dirt from hardwood, linoleum, and marble floors pretty quickly and by applying steam only. This steam mop for wooden floors comes with a set of cleaning accessories which includes more items than some other rivals in its price range offer. 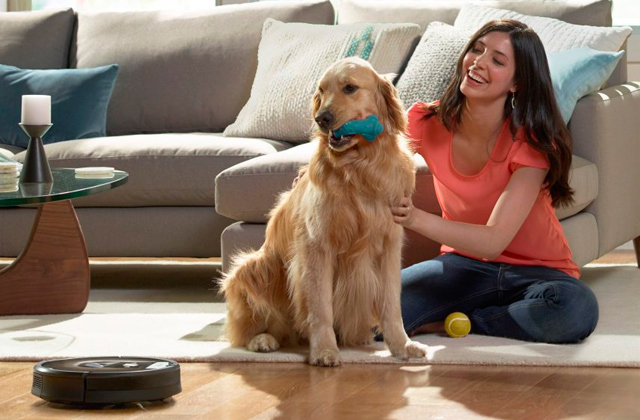 For instance, with Shark, not only do you get the 12’’ rectangular Intelli-Mop head with 2 included microfiber pads but also a garment steamer, a triangle scrubber head, and single-sided dirt grip. Indeed, with such a set, your cleaning options increase greatly. You will be able to steam clean in corners, floor baseboard, grout, and many more. Besides, with the 3-ft hose, you can steam clean even your ceiling (if its finish material allows). 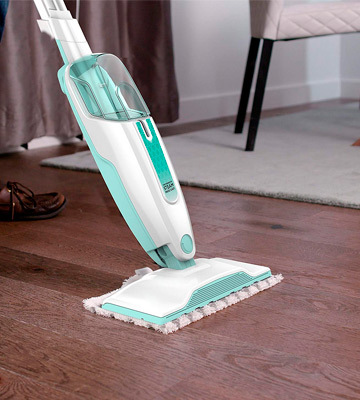 Also, for more convenient above-floor mopping, the S3973D can easily transform to the handheld version - you just need to press the button on the main steamer and pull it away from the mop housing. Next, attach the required accessory to the unit and you are ready to go. 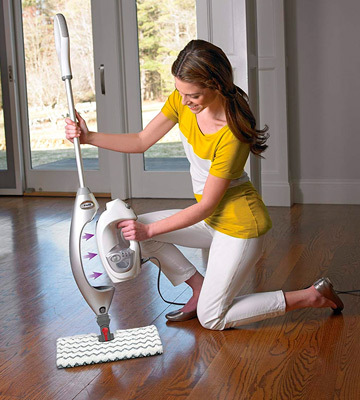 Without a doubt, the Shark professional steam pocket mop has quite a lot to offer to its users. 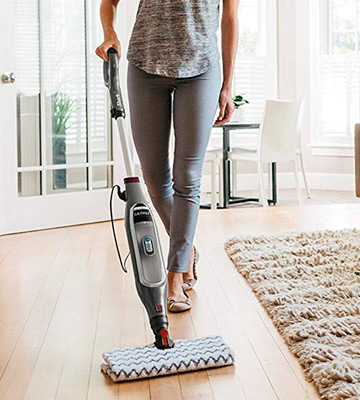 Whether you need to clean the floor throughout your whole house, sanitize your bathroom and toilet, or even remove creases from clothes, this steam mop will fit the bill! In order to make cleaning as simple as possible, Shark engineers have added the touch-free control function to the Intelli-Mop head. 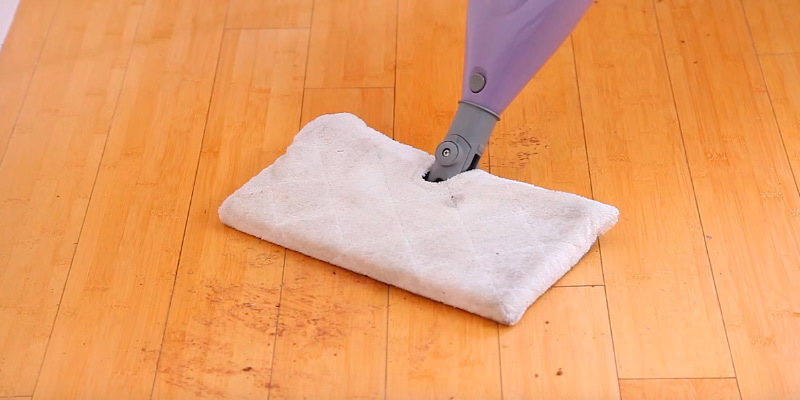 To attach the pad, you’ll need to center the mop above the pad, slip corner tabs into the pockets on the pad, and press the mop head to the floor until you hear the click. Once you need to replace and wash the microfiber pad, just press a release button while holding your mop over a laundry hamper. The mop will slide off into the basket in a blink of an eye, and you won’t have to touch the dirt. Great feature, indeed! As for the pads, they are made of durable microfiber that has excellent dirt grip qualities and will serve you for at least 20 uses. The pads are machine washable. Take note though, it is not recommended to add bleach or fabric softener to water, otherwise, the pads will wear off faster. All in all, the S3973D Shark steam cleaner offers a lot of handy features any customer would like to find in a steam mop. It is user-friendly, powerful, and convenient for sanitizing your entire house. The best thing about most steam cleaners is that they remove the toughest dirt from the surface after a single pass. That is to say, you won’t have to scrub the floor twice or more to make it clean. The S5003D Shark steam mop is the best proof of that. It is made to save users’ time on cleaning so that they have more time for themselves. So, what does this model offer? Actually, a lot! Not only can you mop hardwood, laminate, or marble floors with this mop, you can also freshen your carpets and rugs, sanitize your furniture, grills, toilets, etc. In other words, there are very few things that this steamer couldn’t clean. 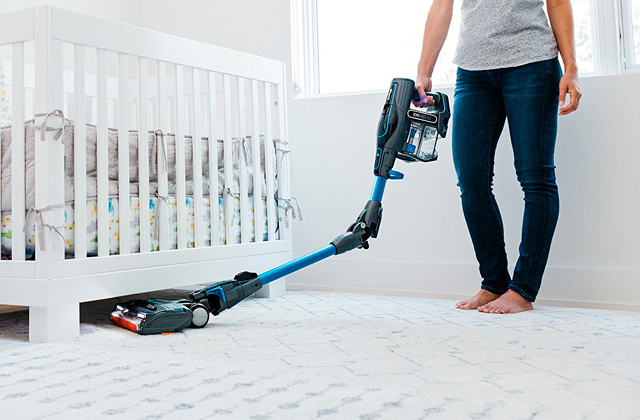 Such efficiency is achieved thanks to the Shark’s innovative mop head design and microfiber pads that catch almost any dirt, old or new, at once. 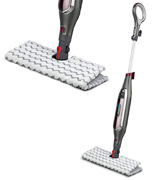 Like many other latest steam mops produced by this company, the S5003D comes equipped with the genius mop head that makes the replacing of mop pads a hassle-free process. This model also features steam blaster technology that we’ve loved so much. The mop head is designed with steam channels which spread steam evenly throughout the mop so that you could clean from both sides of the pad by just flipping it. 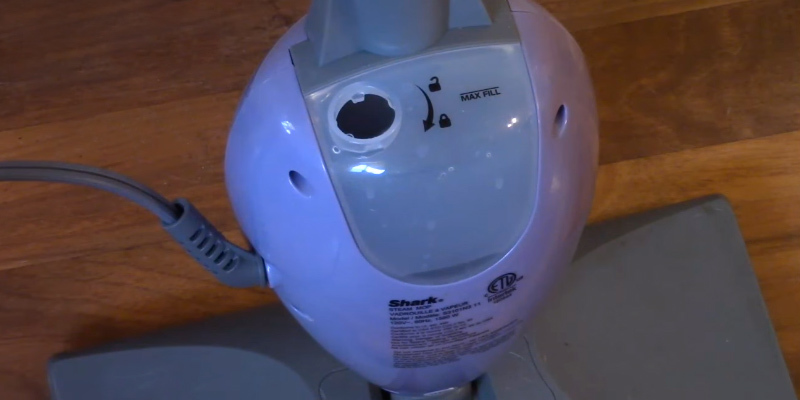 And if you need to apply more steam on a tough spill that has already dried out, you can use the steam blaster located behind the mop body beneath the handle. It blows steam directly on a dirty spot to soften and remove it entirely. 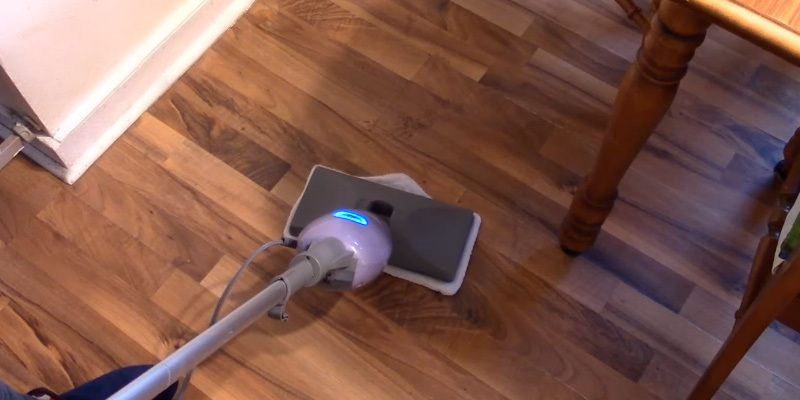 Aiming to save your nerves, time, and your floor from damage, Shark engineers have equipped this mop with the steam control function. It includes 3 modes: LOW, MED, and HI. 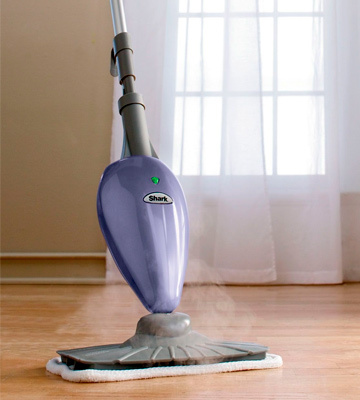 The LOW mode is great for light cleaning and dusting because the temperature of the steam is rather low. So if you need to remove light dirt from hardwood or laminate which is more sensitive to high temperatures than stone, etc., this mode will be absolutely safe for your floors. MED setting is for harder tasks and sealed surfaces. It is also suitable for everyday cleaning, sticky spills, and different small messes. As for the HI setting, it's designed for tough and deep cleaning. This mode can help you deal with the most stubborn dirt and grime. Finally, talking about the usability of this mop, we can’t avoid mentioning its water container. The best thing about it is that you don’t have to wait until the mop cools down - you can add water while mopping, whenever you need it. 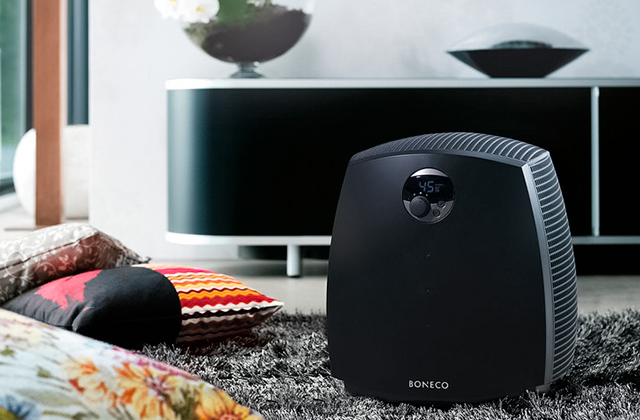 Undoubtedly, with this Shark steam blaster, keeping your home tidy will be a pleasure. The Shark S3501 Steam Pocket Mop is way cheaper than many newer models by Shark, but against the common belief “the cheaper - the worse”, this model proves the opposite. It features a capacious water tank that is enough for cleaning pretty large areas on one fill. Besides, the mop is equipped with a soft-grip telescopic handle and a steam generator of 1550W that will deliver a super-heated vapor in just 30 seconds after starting. The steam intensity is adjusted by shifting the control upward or backward. In such a way, you can easily set the amount of steam you need. A double-side microfiber pad of this steam mop allows you to cover twice the cleaning area with a quick flip of the mop head. If you wish to expand your cleaning options, the manufacturer offers a pretty good variety of accessories for a reasonable price. Thus you can opt for a rectangular mop head with all-purpose cleaning pads, steam duster cleaning pads, and a triangular mop head for cleaning of corners or curvy items. The carpet glider is another handy tool available. 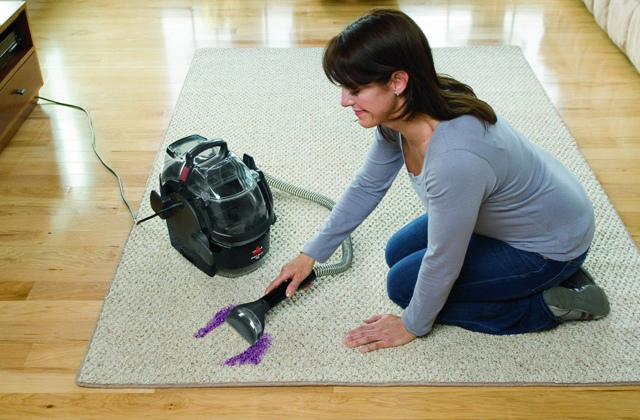 It is made to clean your carpet or sofa, protecting it from the concentrated blast of steam. The easily adjustable handle is another but not the last asset that makes this model so attractive to a user. 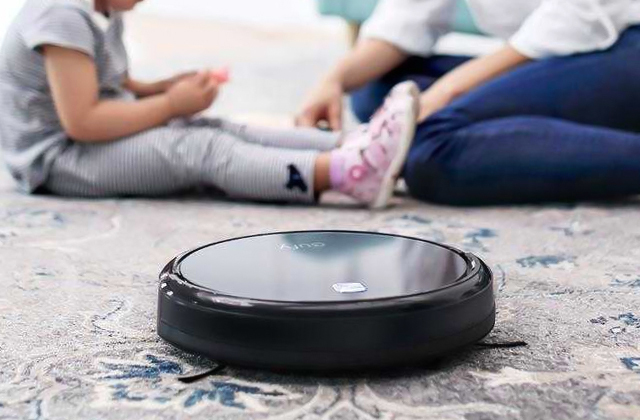 You can change its height by sliding it forward and backward, thus customizing the mop height for each member of your family. Plus, it’s handy when you need to clean above-floor areas. 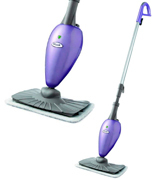 Without a doubt, this Shark steam mop for laminate floors does its job very well for a lovely price. How great and effective a steam mop is, it can have an opposite effect when used incorrectly. The thing is that there are several types of materials and finishes that can be damaged by moisture and excessive heat. It is not recommended to apply steam on unsealed wood surfaces in order to prevent warping, cracking, mold formation, and many other unpleasant effects that may occur when you moisturize brick, marble, stucco, unsealed wooden surfaces, etc. Yes, you may find the information on the Internet that some users sanitize their wooden floors with steam. But, in most cases, it is not clear whether they have been sealed or not. So it is better to make sure that the surface you are going to steam clean is suitable for that or at least work up a small sample area first. Silks, velour upholstery, treated wool products, lace, vintage linen, leather, waxed surfaces, etc. can be ruined with steam. There are many ways to care for even very delicate fabrics without steam. Whatever kind of surface you treat with your steam mop, it is better not to linger on one spot for longer than 15-20 seconds. If you apply steam for longer, it may damage even very tough and solid surface. 10-15 seconds is more than enough to clean any spot and kill bacteria. The Shark S1000A steam mop is a simple device for regular mopping and sanitizing almost any kind of floor finish. This model is cheap, convenient and safe to use. It easily removes light debris and sticky spills from hardwood and laminate floors throughout a house. The design of this mop is lean and mean, so assembling the unit takes no longer than a minute, especially if you follow the instructions included in the box. In practice though, you will hardly need them, since the instruction arrows are molded into the pieces of the mop. The mop head is pretty maneuverable and includes two reusable pads with Velcros for quick assembly. By the way, if you moisten the pad in warm water before mopping, there will be more steam produced and the dirt will come off easier accordingly. 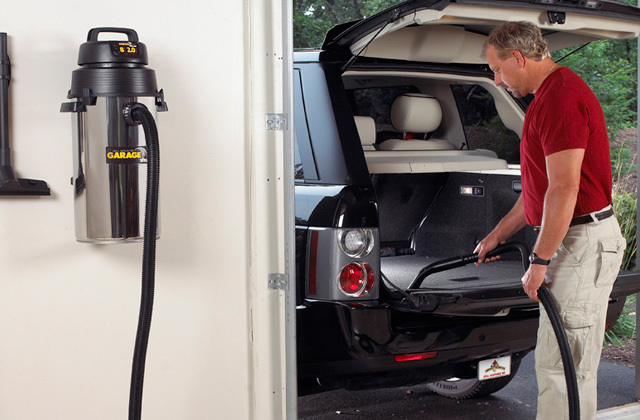 The water container is fairly capacious, thus allowing you to clean large areas at a time. So does a pretty long power cord. It's worth mentioning that the water tank is removable, so you can fill it up right from the faucet instead of messing around with a filling cup. The mop heats up for about 30 seconds after switching on. The S1000A has a manual steam adjustment system, which seems to be its main flaw. The trick is that a user needs to push the handle down and the mop forward to make the steam come out. This may slow you down on tough spills and stains. That's about the only gripe we have. In all the rest, the S1000A does a great job of cleaning. All things considered, this Shark steam mop is a pretty decent model for a very reasonable price. So, if you are on a budget and looking for a steam mop for regular cleaning, this model can be the right choice. Obviously, every appliance has its shelf life, and steam mops are no exception. And in order to guarantee its longer service life, every user should follow the recommended maintenance instructions from the manufacturer. Filling the water tank with the distilled water, especially if you live in the area with hard water, is one of these tips. If distilled water is not an option for whatever reason, water filtration bottle from Shark is offered. This bottle helps trap calcium and mineral deposits as well as reduce the hardness of water by 80%. To prevent the buildup of residue, the manufacturer recommends cleaning the nozzle of your steamer after each use. Some Shark steamers come with a special nozzle cleaner for that, but if you don’t have one, you can simply apply a paper clip. First off, unplug the device and remove the cleaning head, then insert the end of the cleaner into the nozzle, and move it forward and backward to dislodge the build-up. In order to improve steam cleaning results, it is recommended to remove dust and debris from the floor before mopping. This will help prevent the dirt from spreading over the floor and minimize damage to the mop. 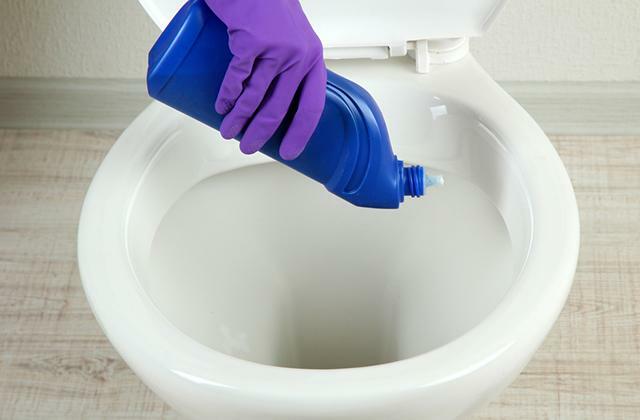 What else you can do in order to maintain the mop properly is to make sure that you remove the wet and dirty mop head after each use and dry the water tank completely so that neither mold nor mineral deposits would form inside it. 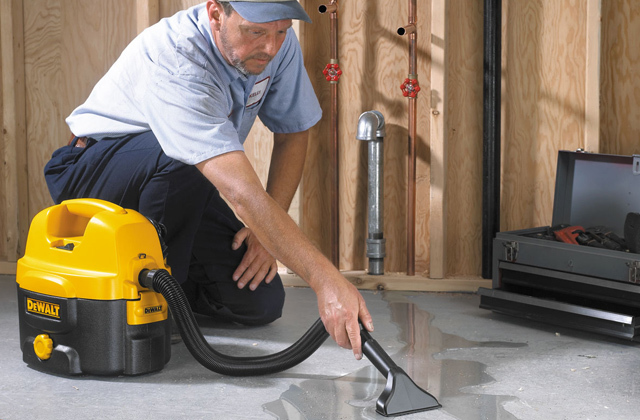 The Shark S3101 is a basic tool for mopping wooden floors and laminate. In two words, this model is made durable and fairly-priced and these are not the only features that make it so popular among users. It is very lightweight - only 4 lbs, which is way lighter than a conventional wet mop, and pretty maneuverable thanks to the long power cord and ergonomic design. Cleaning with this Shark mop is very simple. It is ready to produce steam only in 30 seconds after filling with distilled water. The manual steam control is also trouble-free. To start steaming, you just need to press the handle of the steamer 10-15 times and start mopping. The steam will be pushed out during the process. That is to say, tidying with this steamer is the same as cleaning with a regular mop but it is much more convenient, faster, and mess-free. The Shark S3101 is also quite powerful compared to many other models in its price range. This means the steam pressure and its temperature are quite high to handle tough, old messes. In most difficult situations, it may need a couple of more passes to remove dirt, but frankly speaking, when it comes to the most severe stains, there is no steam mop that will remove them in a blink of an eye. No product is ideal and neither is this steam mop. Its major drawback is the low capacity of the water container. Indeed, it could be larger, but considering that it is located on the top of the main unit and that it comes with a funnel, it is very simple to refill the tank without spilling water. Additionally, you don’t have to wait until the mop cools down. The unit cools down almost immediately and you can refill it 30 seconds later after it gets empty. All in all, this Shark steam mop for wood floors is a cheap and reliable tool that is able to clean almost any kind of dirt from floors, stairs, and other flat surfaces with minimal efforts and no chemicals. How to Steam Clean Carpets and Rugs? There is hardly any person who would like to spend hours on carpet cleaning: scrubbing it with soap and a brush, rinsing it off, and then waiting for several days until it dries out... all these things are really annoying. Instead, you could use a cleaning service, however, with a steam mop in your closet, you won't need to spend extra time and money. So, if you are a happy owner of a steam cleaner and wish to breathe new life into your old rug, keep on reading. The whole process takes an hour or so. Finally, vacuum the rug once again to pick up the dirt that was lifted out while steaming. 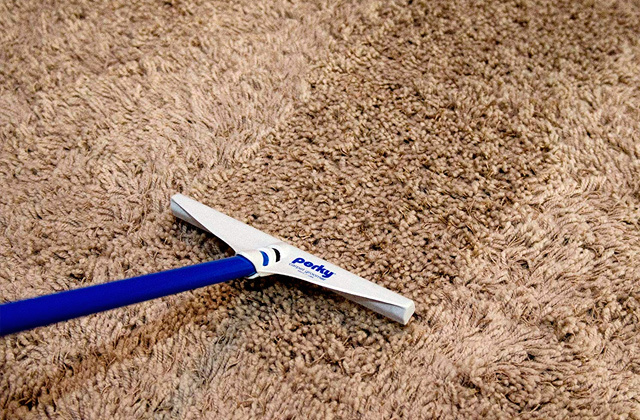 The best thing with this cleaning method is that you can freshen your carpets every month so that there will be no need in heavy-duty annual cleaning. What Is a Shark Steam? Long gone are those days when you had to drag a bucket of hot water around the house to mop the floor. Today, cleaning is effortless, to say the least. No more do we have to spend hours on tidying - you'll need just 15-30 minutes per day and a couple of household appliances to clean small messes and keep your dwelling always tidy. And no, you won’t have to spend a fortune on this, a vacuum and a steam mop will make the job done. A steam mop has a similar design to a regular mop but unlike the mop, it has a different principle of operation. It spreads steam over the microfiber pad and floor so that it would be easier for users to draw off the dirt from surfaces. Water in the reservoir is heated up to 248 degrees Fahrenheit and then it turns into steam to remove not only dirt but also bacteria, bed bugs, fleas, etc. By the way, when it comes to steam mops or steam cleaners (which are similar to mops but are a bit bulkier and equipped with more cleaning accessories) you don’t need to add tough chemicals to water like you'd have to using a regular mop. A distilled water works just fine. 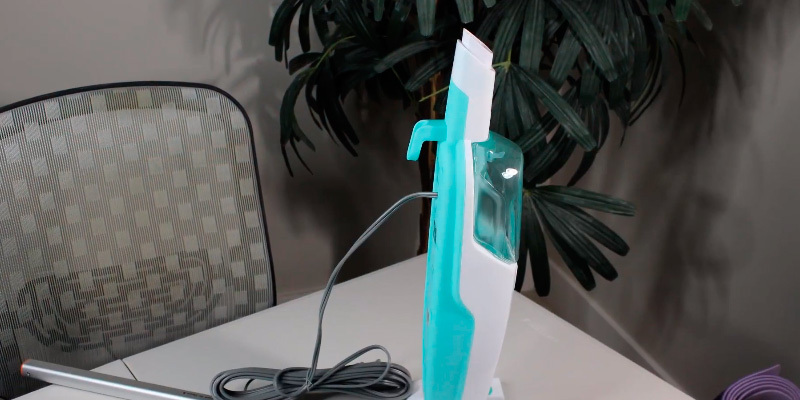 In this review, we’d like to tell you about stream mops by Shark, the company that can rightly be called a pioneer in the production of small household appliances and cleaning solutions. As a rule, a steam mop looks very similar to a handheld vacuum cleaner. It consists of a handle, cleaning head, and the main unit which unlike a stick vac has a water tank and a steam generator. When it comes to steam cleaning devices, a steam generator is one of the essentials you should take into account. The power of steam mops ranges from 1050W to 2000W and determines two things: the amount of steam pressure and its temperature. Consequently, the higher the wattage, the higher these figures. Also, the power range influences the starting time of the mop. 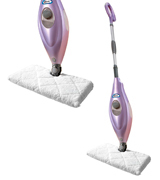 More powerful mops generate steam faster so that you could spend less time on cleaning. You shouldn’t forget about the capacity of the water tank either. This figure influences the convenience of use. For example, 15 fl. oz. tanks and higher are good for cleaning large areas. The ability to refill the tank without waiting for it to cool down is also a nice option to have. Obviously, the cable length and the weight of the mop are important. Indeed, dragging 15 lbs mop behind while looking for a new socket is very frustrating. So, the longer the cable, the better. At the same time, there are many other features that guarantee a user not only tidy floors but also enjoyable cleaning. 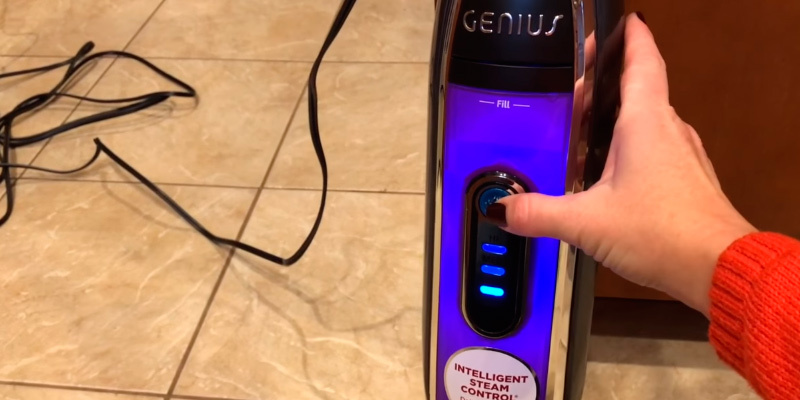 "Add-water" and "Steam-ready" indicators, switches that are conveniently arranged on the handle, simple transformation to the handheld position, and steam control are only a few of all the handy features you may get with a steamer. Looking at control indicators, you will always know when it’s time to refill the tank and when your mop is ready to run. If there is a steam on/off lock switch on a mop, you will be able to turn the continuous steam flow while tidying large areas. With steam adjustment, you’ll be able to change steam temperature and clean a variety of surfaces without the risk of their deformation (the temperature that is suitable for tiles won’t be the same for your laminate floors). The last but not the least is the number and the quality of the attachments that come in the box. Every mop comes equipped with a microfiber mop pad. 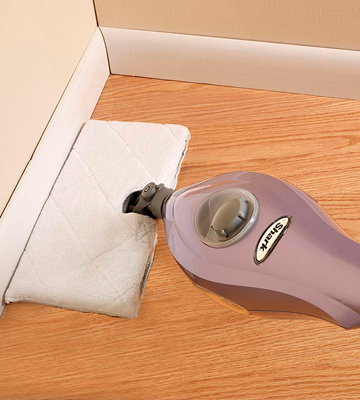 Typically, it is about 12’’ in width which is convenient for cleaning large areas such as floors, carpets, etc. The mop pad is one of the basic attachments, still, there are many other nozzles you can benefit from. The more different brushes come in the set, the more surfaces you'll be able to sanitize. Steam does wonders with tile surfaces! No more do you need to scrub tile and grout in your bathroom or kitchen with harsh chemicals until grout lines become greige again. All you need is your steam mop and a little of patience to make your home look like new. As we have breached the topic of tile cleaning, we can’t avoid mentioning how indispensable a steam mop can be in the kitchen. You can clean and disinfect almost any item and surface with this helpful appliance there. Would you like watch the cooking of delicious pudding or cake through the oven doors again? Then go and grab your Shark steam cleaner. 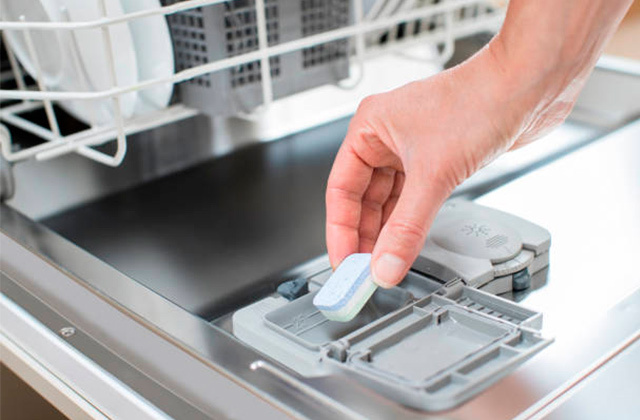 It can clean everything from a microwave oven to the fridge. Because of the constant contact with our hands, handles and switches around our house can shelter a lot of bacteria. Since a steam cleaner kills about 99.9% of bacteria, you can keep these parts neat in a matter of a couple of minutes now. And this is without using harsh chemicals that can be toxic for us. There are so many ways to remove ingrained food and grease from a grill but most of them cost much time, scrubbing, and eventually may damage the sealing. For example, you can immerse the grate into ammonia overnight and then wash it in a soapy water. You can also place it into the oven if its size allows and bake it for about an hour by heating it up to 500 degrees, then wait until it cools down, and wash it with dishwashing liquid. However, take note that there will be much smoke and bad smell while baking the grill, so don’t forget to open all windows. OR, you could use your Shark steam cleaner to loosen grease and remove it. This method is way faster and won’t turn your flat into a smokehouse. Needless to say how dusty and covered with dead bugs patio furniture can become in a few weeks after the start of barbeque season. To save a great amount of time on brushing it all up, you can apply your Shark steam cleaner and get rid of all the dirt in an instant. With a steam cleaner, you can furbish up lots of things in your car with the exception of the engine and some other running parts (we’d leave this job for a mechanic). Apart from that, your car seats, carpets, and other upholstery will look like new after a few minutes of steam cleaning. If you have decided to refresh your room and change the old wallpaper or paint the walls, you can take your steam cleaner to remove paperhangings faster. 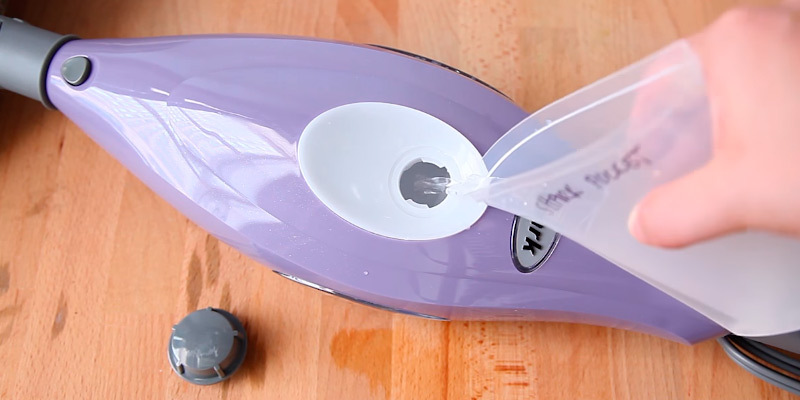 Start with perforating them so that the glue could soften faster, then apply steam on the surface, and finally scrape the paper with a scraping tool. If you have kids and a ton of plush toys that they love to play with, you probably spend hours on their disinfection. Positively, a steam cleaner will help you speed up the process since steam kills up to 99.9% of bacteria. In addition, you won’t have to use harmful cleaning solutions and sprays that may cause allergy. This is a great idea to wash something that can not be put in a washing machine, right? In some cases, this approach will work, but if you own a foam memory mattress, we wouldn’t recommend you apply steam on it since it might be ruined. You can try other, safer ways to clean it.